I am a student and plan on remaining so until long after I graduate. I’m also a self-declared ‘itinerant architect’, and during the past couple of years I have travelled to a number of countries as I develop my craft – and passion – of architecture. I have explored these different cultures as a way to understand the role of architecture and craft in a contemporary society – the chosen topic of my current graduate architecture thesis. My most recent foray into foreign territories found me in Bangkok as I began the fourth instalment of my two year degree, after having spent time in Europe, South America, and Canada. 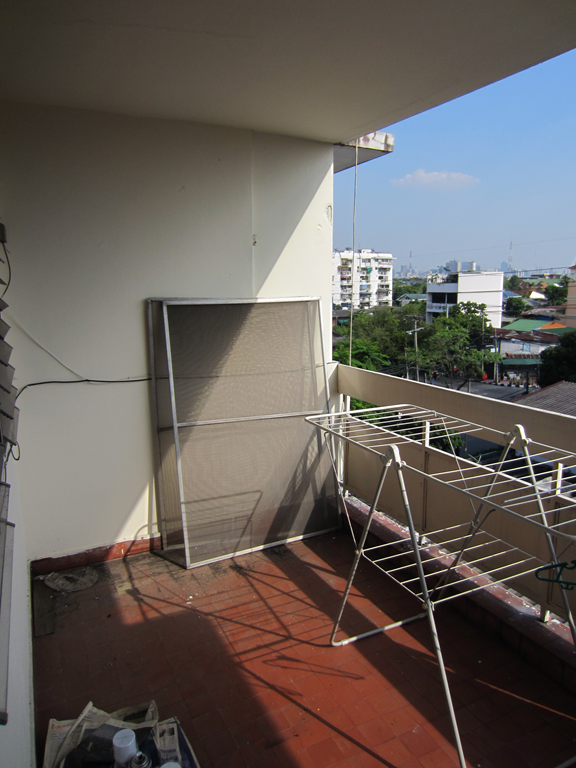 While in Bangkok, I developed the latest chapter of my thesis narrative which is essentially a documentation of the design and craft of a series of interventions that serve as a means of understanding my transient environment. I began the Asian component of my thesis in Bangkok, and invariably began to compare it to Lima (Peru), both of which I had chosen to spend time in as the challenges of these foreign environments offer learning curves not readily available in the comforts of Canada or Europe. Bangkok made a great place to start for a number of reasons, including the large international airport and a relatively low cost of living, and so I looked forward to starting work in the city. I would describe Bangkok as a relatively easy city to navigate as it has some incredibly friendly people, a highly advanced public transit system, a great (and affordable) cuisine, and a shockingly low crime rate for a metropolis of its size. As I am interested in understanding culture through craft, I was eager to get started, and before too long I found myself in the district of Dusit. Situated north of the city centre and east of the Chao Phraya, Dusit has a network of canals that are reminders that a vast expanse of wetland once existed under the tonnes of concrete we now call Bangkok. 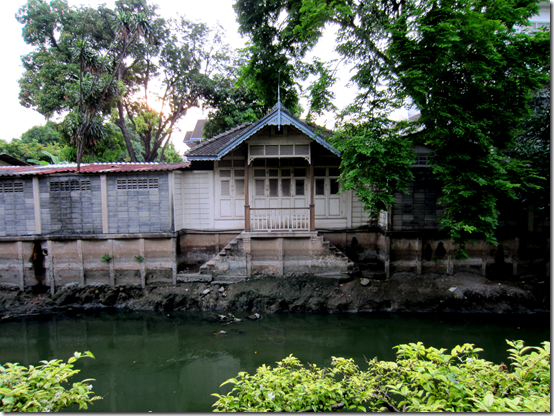 The majority of the existing canals are no longer used as they feature black water that is far too polluted to be of much use, and in my exploration of these canals I caught a glimpse of an environment in which the craft involved in the informal housing typology deserved a closer look. Makeshift bridges and gates in various stages of disrepair spanned the terror of the canals below and had me cringe whenever someone dared to venture across. The building materials of choice ranged from cheap corrugated galvanised iron plates to beautiful weathered timbers, and as is the case in many of my interventions, I decided to allow the latter to inform the materiality of my ninth project. My ‘client’, or ‘host’, depending on one’s perspective – perhaps I’ll just call him my friend, as this is now certainly the case – was one of Thailand’s top fashion designers, and had transformed his apartment into an atelier. It featured a plethora of clothes, sketches, and material samples, and I truly enjoyed the entirety of my twelve days here. Of particular interest to me were the two balconies that adjoined either end of his living space and faced north and south; they were critical in bringing in the summer breeze during the swelteringly hot days of mid-April. Although the north-facing balcony featured several plants and a quaint seating arrangement, its southern counterpart was comparatively hot, sunny, and arid to such an extent that the southern windows, which actually received very little direct sun, had been covered up, leaving the balcony largely forgotten. And so, in accordance with my thesis ambition to realise the fullest potential of designed space by means of an intervention, I decided that this balcony needed to become integrated once again into the main living space, and that I would utilise the qualities of reclaimed wood as a means for achieving this. The ensuing design was simple (it often is), and yet infuriatingly complicated (it always is). I decided to compliment the ‘wet’ daytime northern balcony with a dry, evening-oriented southern counterpart. A key component to this would be the lighting system, and how I could use this to highlight the reclaimed wood I would soon obtain. As I had no tools aside from a hammer, drill, and a rusted antique saw that I obtained from a neighbour, I had to meticulously plan everything in advance as I would need all the pieces measured and cut prior to bringing them back to the apartment. I set out one morning armoured with a lavish amount of sunscreen, my sketchbook, and a few key phrases in Thai to help me in communicating with those who lived alongside the canals. Although I had seen a lot of promising wood in my days of exploration, it somehow seemed to vanish as soon as I went looking for it. The amount that I did manage to come across was either rotten or critically important to the residents as they simply weren’t selling. I had assumed that wood would be relatively easy to find, but it turns out that the supply of wood in Thailand is shockingly low. The current king, who has now reigned for over sixty-five years, has driven the economic growth of Thailand through the expansion and export of agriculture. As a result however, many of the forests in the country have disappeared, and as of 1989, a complete logging ban has been in effect, although it does continue illegally in some regions. This has increased the cost of wood accordingly, and has made reclaimed wood a popular (and aesthetically pleasing) choice for many builders. 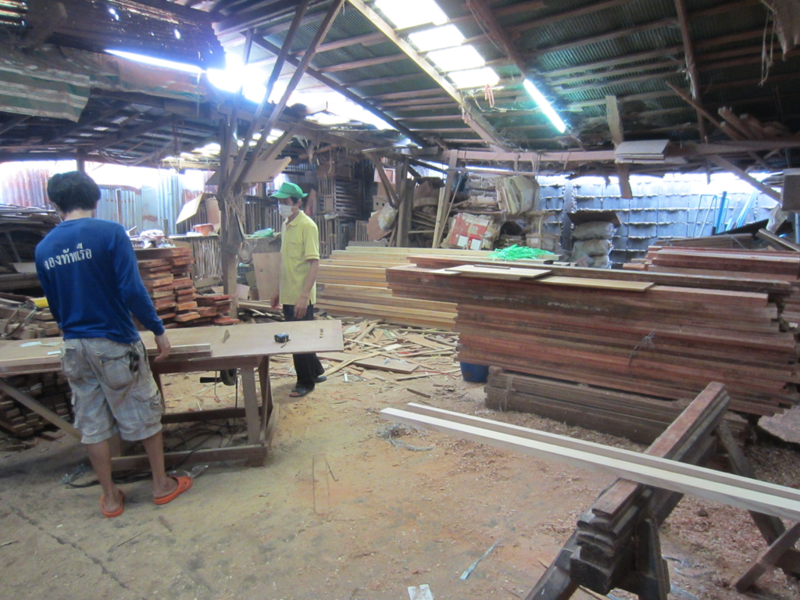 Although there are several areas just outside Bangkok where one can obtain large quantities of this wood at a reduced rate, I didn’t have this luxury, and had to find something local. And as my day of material sourcing proved fruitless, I turned to local wood suppliers, where convenience begot inflated costs. It turns out that reclaimed wood is also very expensive (close to one hundred USD for a single timber that would suit my purposes), and so again, I had to make sacrifices and decisions as my options dwindled. 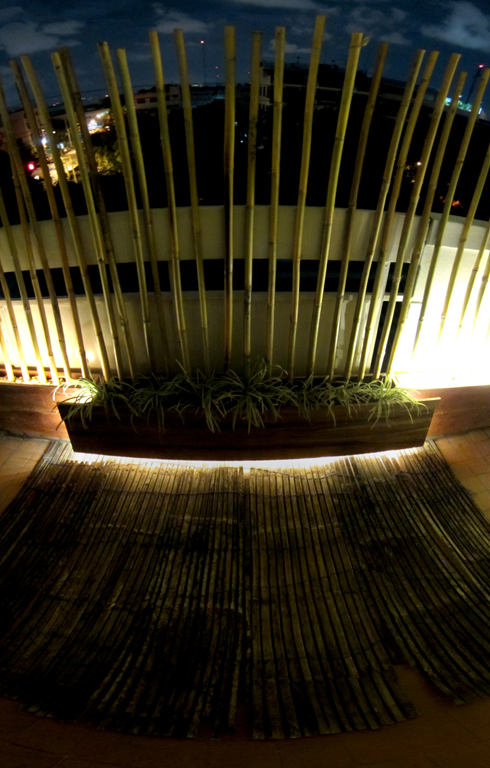 I opted to source plywood for 80% of the project, a glulam board for the ‘highlight’ piece, and an old Venetian blind to provide the textural quality that the balcony needed. Many of the measurements had to be adjusted, and I managed to resize everything appropriately with one exception (that took one frustrating hour with the saw to remedy). Although I didn’t end up with the end result I had envisioned, the craft involved in working with unexpected challenges and assembling a kit of parts from a variety of sources yielded a product that is far more valuable to my evolving thesis narrative. 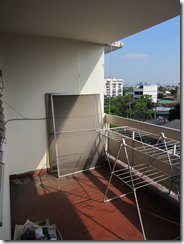 This Bangkok intervention was the ninth in a series that has driven my thesis narrative to date. Designed as a space activator, it is successful in improving the spatial quality of the associated living space while maintaining as nominal a footprint as possible. This is a perfect example of how minimal my constructions are, and yet are crafted to have as large an impact as possible. The balcony garden is but one of my interventions that achieves this, and in doing so, I impart upon the owner a greater understanding of the value of craft in a contemporary environment that is ripe with misguided attempts to improve daily life. Gordon Hunt is a graduate student currently researching his thesis at the University of Waterloo School of Architecture in Canada. Originally from Hamilton (Canada), he has lived in New York, England, Sweden, Italy, Australia, and Peru. He is now writing from Asia, the fourth and final continent of his two-year global trek as an itinerant architect. You can follow his thesis travels at www.gordonhunt.tumblr.com. The pleasures of craft work are often said to reside in its immediacy: the direct access to materials, the handling of tools, and the sense of accomplishment. Even watching a demonstration in person can be an absorbing experience. Yet texts about craft, including this journal, must necessarily present secondhand the process of making. Language alone simply cannot account for craft’s scope of experience. Drawings, paintings, photographs, films, and virtual simulations, all in their own ways, would seem to fill this evident gap, transmitting the reality of skilled work in something closer to its fullness. However, they usually fall short. In the representation of process, such images create a new, different level of material reality, one that needs to be analyzed in its own right. In this issue we concentrate on the phenomenon of “showing making,” a phrase proposed by Dutch scholar Ann-Sophie Lehmann. When welded together, these two verbs suggest the complexity of craft-in-representation, which always involves a dynamic interplay between artisan, artifact, tool, and image. Each of our contributors examines instances of such convergence. Three articles are drawn from a conference held in 2009, which was organized by Lehmann with Nico de Klerk at the Filmmuseum in Amsterdam (EYE), supported by the Meertens Institute (Royal Netherlands Academy of Arts and Sciences). Lehmann’s own theoretical overview presents a methodology for the study of “showing making,” and then applies it to the example of hand-colored Japanese photographs. She demonstrates the recursive logic of these images, which offer a kinaesthetic pleasure to the viewer while also constructing a self-referential impression of a craft formed at the intersection of traditional painterly skills and new technology. The papers by Victoria Cain and Irene Steng, also drawn from the 2009 conference, illuminate two other contexts in which photographic images extend and transform the meaning of craft. Cain focuses on an intriguing case study: the preparators who made dioramas at the Natural History Museum in New York City in the earlier 1900s, especially in the 1920s and 1930s. These workers’ skills recall those of taxidermists, propmakers, and scientists, but had a specificity and theatricality of their own, which were exploited enthusiastically by the museum in its programmatic and promotional activities. Cain situates staged photographs of the preparators within a broader range of images of craft process circulating in the interwar period. Her argument is that these decades—often thought of as a period fascinated with machines and technology, to the exclusion of handwork—were in fact saturated with such pictures. This widely shared “craftsmanship aesthetic,” she writes, offered an ameliorative or reassuring counterpoint to narratives of technological progress that were equally current at the time. Cain’s article can be set alongside Ezra Shales’s analysis of the Empire State Building (published in our July 2011 issue) as a major contribution to the understanding of modern craft in interwar America, outside the boundaries of the incipient studio movement. At first, Stengs’s article, on the representation of kingship in Thailand, could not seem more different. She shows how the carvers and gilders who make sculptures of the Thai rulers operate in relation to popular photographs. Another example of “showing making” arises in her discussion of live demonstrations that are conducted in markets and temple complexes. This performance of craft takes its place within a diverse image-scape which has as its goal the consolidation of national identity. Perhaps it is only through the unstated relation of these various representational registers that such an impression of unity could be achieved. Henrietta Lidchi’s discussion of Native American jewelers also involves the analysis of a single craft from multiple angles. Historic photographs and live demonstrations again play a role in her account, as do written texts, oral history interviews, and Lidchi’s firsthand observations of the Southwestern markets in which iconic silver and turquoise jewelry is displayed and sold. The article is exemplary in its juxtaposition of past and present, showing how the tools of anthropology can be brought to bear on both history and the present day. In her manifesto on “showing making,” Lehmann alludes to the oft-used phrase “the social life of things,” originally formulated by Arjun Appadurai. She insists that this biographical model needs to be extended to include the making of objects, and to this we might add historical precedents—the crafts of the past that make present endeavors possible. A biological or familial metaphor is at the heart of this issue’s Statement of Practice by boatmaker Gail McGarva. She has dedicated her life to the replication of open-sea working vessels, vernacular designs carrying strong associations with particular stretches of the British shoreline. McGarva refers to her lovingly made copies as “daughterboats,” a way of capturing the generational rhythms of craft succession. Given her interest in such legacies as the taproot of contemporary communities, it is perhaps no surprise that she makes her boats in public and invites others to watch, and even participate in the building process. This is another example of “showing making,” this time to the same community that developed and supported the regional product in the first place. Finally, we include a primary text that is not a description of craft process, but rather a spectator’s response. The author is the indomitable Margaret M. Patch, who, despite her relatively advanced years, went on an extraordinary, round-the-world-ineighty- days-style tour (though it took her a bit longer than that) in the early 1960s. Her mission was to compile a list of the leading contemporary craft reformers, activists, and developers in advance of the inaugural conference of the World Crafts Council, held in New York City in 1964. As she traveled, Patch paid close attention to cultural differences in practice and attitudes to skill. The previously unpublished text we include here was written early in her journey, and compares the craft cultures of Japan and India. Patch had a high regard for the artisans she found in both places, but was dismayed at the low status of those she encountered in India. This prompted her to reflect on questions of aspiration and recognition that had implications for craft anywhere, including back home in the United States. This is one example of the way that “showing making” can be an invitation to consider one’s own act of looking, and hence position in the politics of skill. 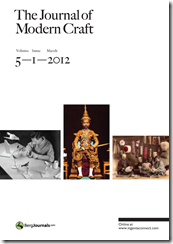 The first issue of 2012 considers the way in which craft is represented on the public stage.